I am getting ready to do some serious writing over the coming months about what Hannah Arendt called “the Banality of Evil.” Banality is not a word often used now days. But it simply means trivial, uncreative or simply ordinary and unremarkable. I have been pondering this for years and believe that history has to be continually learned and written about in order not to see it repeated. I studied Weimar and Nazi Germany as well as the Holocaust under Dr. Helmut Haeussler at California State University at Northridge as an undergraduate and in a year of graduate studies. I also continued that study while in Seminary as well as in my Masters Degree in Military History. I was stationed in Germany several times, done an exchange tour with the German Army and my German friends say that I am fluent in German. I have been to Nuremberg, Dachau and Bergen-Belsen. I have stood on the reviewing stand where Adolf Hitler preached to the multitudes of assembled party faithful on the Zepplinfeld in Nuremberg. I have broken out many of my old books used in my various degree programs as well as as the resources of museums and universities now available on the internet. I am also watching films about the era. Not war films, films about the ordinary men that carried out these crimes either by pulling the trigger, pushing a button, signing an order or simply turning their backs and remaining silent. 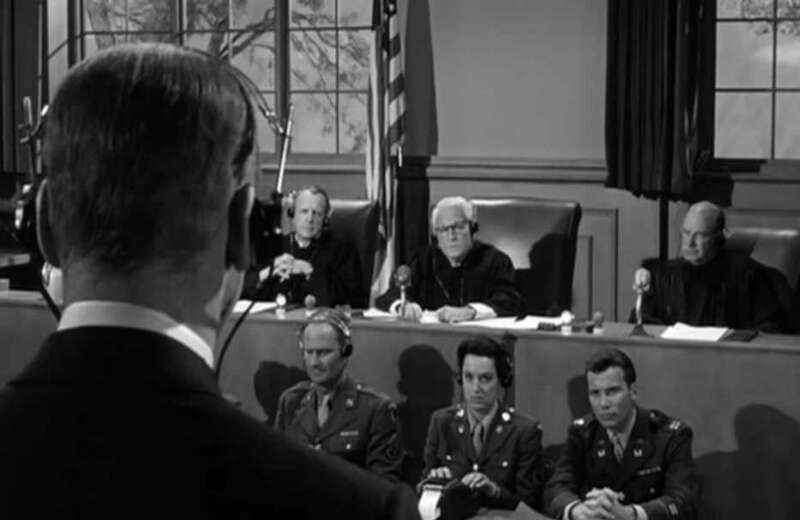 At the end of the movie Judgement at Nuremberg Spencer Tracy as the Presiding Judge Dan Haywood concluded his sentencing remarks with this statement. It is perhaps one of the most powerful statement and something to remember as the Unholy Trinity of Politicians, Pundits and Preachers urge us to hate one another and those different than us. It is something that is especially needed in times of great societal stress as well as real and perceived dangers from without and within. This is an unsettling subject and people on the political right and left in this country are apt to compare their opponents to those that were tried at Nuremberg and those that led them. However it is possible that any party in society when divided by fear, hate and the desire for power can behave just as the industrialists, financiers, doctors, soldiers, jurists, civil servants, pastors and educators who oversaw those heinous crimes. People that should have known better. I have read a number of German soldiers’ biographies, and the most striking common feature is the lack of support for the Nazi party. The soldiers joined to serve their country and to protect their homes – I realise that sounds odd, but the German soldiers saw attacks on Poland and France as defensive in nature. It wasn’t until the invasion of Russia that many soldiers began to believe the propaganda. “These people actually do live in mud huts with their animals – maybe Hitler was right about them” is a recurring theme. Once the soldiers began to believe the propaganda, it was only a few small steps to mass murder. Small seeds of truth, cunningly nurtured, can turn people’s beliefs on their head. The Nazis came to power promising jobs, prosperity, and national pride – once those promises were delivered, people were willing to follow. And sadly enough, can be led just about anywhere. I’d love to see what you write. If you need a cheap proof-reader (cheap – as in free! ), give me a holler.